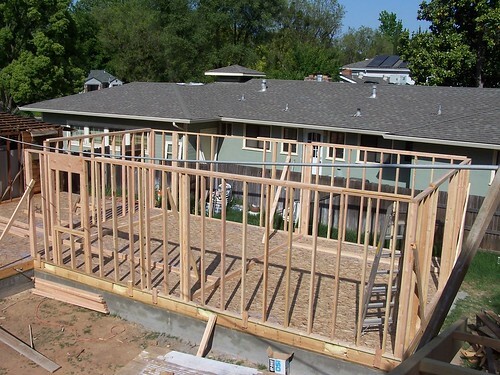 Our addition is “decked” and the first few walls have been framed! Check out more photos on the [addition framing photoset](http://www.flickr.com/photos/sonicchicken/sets/72157600226916982/) on Flickr. This entry was posted in Our home remodeling project, Uncategorized and tagged framing. Bookmark the permalink. One Response to We have walls! W00T!!! Lookin’ good!! Now, if only there was a way to get that pesky roof off….